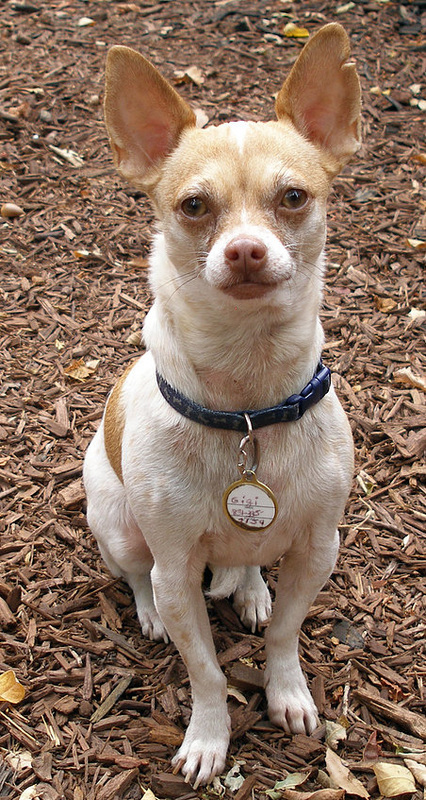 ​Gigi is sweet petite three-year old Chihuahua found as a stray and brought to the Santa Cruz County Animal Shelter. She has been in a loving CAPE foster home for about a year with four other dogs, big and small. Gigi had a bit of a rough start and is initially fearful of new people, dogs and situations. Gigi has relaxed into her foster home and has gained a lot of confidence. In her home environment she is happy, silly and fun. When she feels safe she is very affectionate, loving lap-time and giving sweet kisses. She loves her squeaky toys and chews. She initiates her nap times and you will find her blissfully snuggled into her bed. Gigi rides well in the car. She enjoys walks in a low stimulating environment and does nicely on leash. Gigi knows basic commands of sit, wait, and high five. She is housetrained but will use a puppy pad if her people forget to ask her to go out. In a focused home she will most certainly make it to 100%. The ideal home for Gigi is a calm stable environment without a lot of new people coming and going. Kids are not recommended. She would do well with the company of another dog that was calm and confident. Her new family would need to be to be committed to supporting her through her fears. By doing this they would be a part of the magic of helping a very special dog heal and share her silly happiness. For more information call Nancy Eaton 831-684-2421.